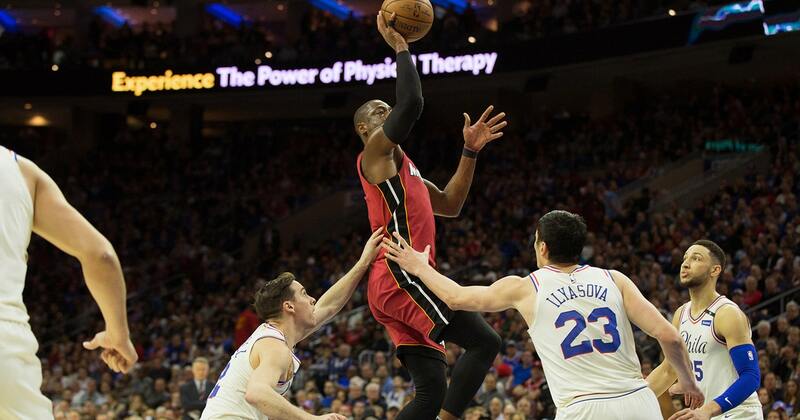 PHILADELPHIA (AP) —Dwyane Wade turned in a vintage performance, scoring 28 points to end the 76ers‘ 17-game winning streak and lead the Miami Heat to a 113-103 Game 2 win over Philadelphia on Monday night and even the first-round playoff series. The 36-year-old Wade made his first seven shots of the game and passed Larry Bird for 10th on the NBA’s career postseason scoring list. After a Game 1 victory where they couldn’t miss, the Sixers couldn’t make a big bucket in the first half. The Sixers made a team playoff-record 18 3s in Game 1 and missed a whopping 16 of 18 3s in the first half. Robert Covington missed all five and Dario Saric was 0 for 4. The Sixers made four baskets and scored 13 points in the quarter. 76ers: Philly native and Hollywood star Kevin Hart rang the ceremonial Liberty Bell and sat courtside a few seats down from Allen Iverson. … Team consultant Jerry Colangelo was at the game. Ilysaova got the start at center for the first time in Embiid’s absence over Amir Johnson.